Nada fighting festival is the popular festival held at the Matsubara Hachiman Shrine in Himeji City. It came to be called by this name “Fighting Festival” because the mikoshi (portable shrines) are jolted against one another when carried on the shoulders of the men in the parade. The greatest attraction is the struggle among 3 portable shrines when men over 35 years old wearing white headbands, men 26-35 with yellow headbands and youths under 26 marked by red headbands, holding bamboo poles in their hands, join in the fight. 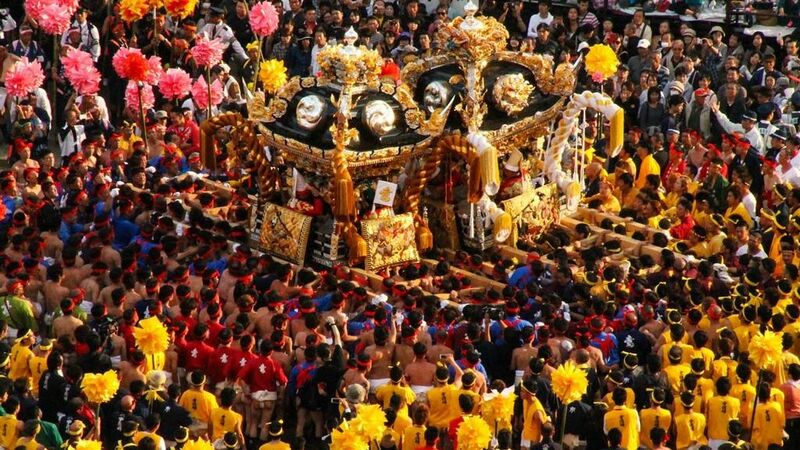 The highlight of this festival is “Yatai-neri”, the parade of “yatai”, festival floats, gorgeously decorated with wood carving, gold and silver handiwork and embroidered curtains. The yatai are carried on the shoulders of men and are surrounded by the men holding “shide” (bamboo poles decorated with colorful paper) in their hand. As dusk sets in, illuminations on each of the yatai are lit. Access: 3-minute walk from Shirahama-no-miya station on the Sanyo Dentetsu Honsen Line.